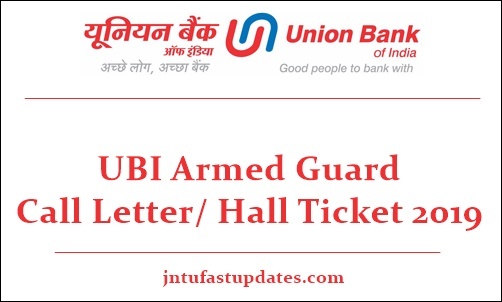 UBI Armed Guard Admit Card 2019: Union Bank of India (UBI) is going to conduct the armed guard written test on 17th March 2019. In order to attend the examination applicants need to download UBI Armed Guard Call Letter 2019. The hall ticket/admit card will be accessible to download on UBI official website, unionbankofindia.co.in. The hall ticket/admit card will be accessible to download before few days of the examination. Candidates can get ready to download the hall ticket soon. Candidates who are going to compete for armed guard posts must prepare well to crack the examination as the competition is sever this year. Competitors who are going to attend the armed guard examination can check the details about hall ticket availability date, downloading process, guidelines for the examination, and other details from this article. Union Bank of India (UBI) headquartered in Mumbai and having over 4,300 branches worldwide. The bank hires the eligible candidates into various posts every year. UBI released the notification for 100 armed guard vacancies. Many of the eligible and interested aspirants have applied for UBI Armed Guard vacancies in the months of January/February months. Selection of aspirants will be done through the written test and interview rounds. Candidates cleared all the rounds will be placed in armed guard posts in various branches. All the hopefuls applied for UBI Armed Guard posts can download the hall tickets from the UBI website, unionbankofindia.co.in. The examination is going to be conducted on 17th March 2019. Hence the hopefuls competing for the UB. Armed police posts can expect the hall tickets before 10 days of the examination (tentatively). Hall ticket/admit card is one of the curtail documents needed to carry to the examination. Hence the hopefuls have to take it as a must while going to the examination. The examination invigilators will let the hopefuls to write the examination only after checking their admit cards. Hopefuls can visit UBI website to download admit cards. Click on UBI Armed Guard admit card.